QWED is a dynamic hi-tech company, set up in 1997 and based in Warsaw, Poland. Being a happy blend of academic researchers, microwave engineers and computer experts, we develop and produce electromagnetic simulators of supreme accuracy, tailor-made to users' needs in a friendly format, several types of resonators for precise measurements of electromagnetic properties of materials at microwave frequencies and Microwave Frequency Q-Meter - an inexpensive computer controlled microwave oscillator system that enables quick and automatic measurements with a dedicated resonators. Currently QWED employs 8 people and cooperates with 6 consultants. 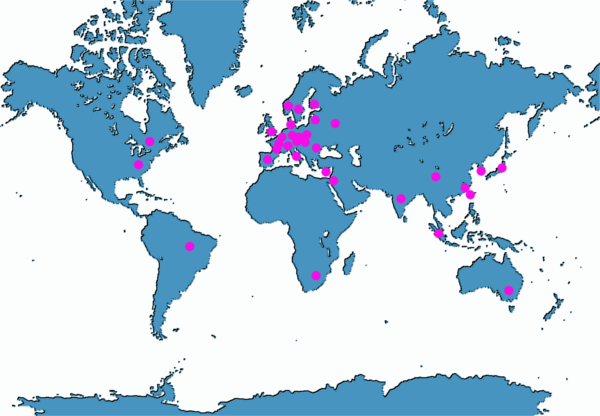 Clients in 33 countries on six continents have applauded consistent high quality of QWED's products and services. QWED invented and commercially develops electromagnetic software packages of the QuickWave series and apply to electromagnetic research and industrial design. QW-Modeller is a free CAD modeller for QuickWave and can be used without any restrictions for preparing complete projects for electromagnetic simulation with QuickWave software. QuickWave 3D is a universal user-friendly electromagnetic software based on the conformal FDTD method and supplemented with a range of unique models for curved boundaries, media interfaces, modal excitation, and parameter extraction. QuickWave V2D is a specialised software tool for the analysis of axisymmetrical structures as large as 2100 wavelengths, including antennas (horns, rods, biconical), circular waveguide discontinuities, and resonators. It is based on the Maxwell equations re-expressed in cylindrical coordinates. Hundreds times faster than brute force 3D analysis. Additional modules like Basic Heating Module, optimisation and parameters sweep tool, QProny module, GPU and multithread versions of QW-Simulator, and QW-AddIn for Autodesk® Inventor® Software makes QuickWave software very convenient in use and applicable for wide range of applications. QWED manufactures several types of resonators (also referred to as test fixtures) for precise measurements of electromagnetic properties of materials at microwave frequencies. Each resonator is equipped with specialised software for extracting the relevant data (typically, complex permittivity or real permittivity and loss tangent) from measurements. The resonators and the accompanying software are based on years of research led by QWED's expert Prof. Jerzy Krupka and documented in dozens of worldwide-appreciated scientific and technical publications. The quality of the resonators has been recognised by industrial practitioners, leading researchers, and industrial standard creators. QWED is especially proud of recognition by Agilent Technologies who decided to supplement their 85071E Material Measurement Software with Option 300 serving directly QWED's Split Post Dielectric Resonators. QWED also produces Microwave Frequency Q-Meter which is a pocket size device allowing quick and automatic measurements of material properties with a dedicated Split Post Dielectric Resonator and Single Post Dielectric Resonator.